Taking abuse seriously means that you understand that the very last thing abuse survivors and victims want to hear is that you conducted your own, private investigation and thereby discerned an alleged victim was not credible. Since you take abuse seriously, you know that the reason so many churches are being rocked by issues of child abuse and spousal abuse is because those churches do exactly that: they conduct their own “internal investigation” despite not being experts in abuse and then declare the alleged victim a liar or a sinner or a mentally unstable person. Taking abuse seriously means that, even if you believe certain abuse allegations are false, you refuse to invoke the very language abusers would invoke to discredit their accusers: “mob mentality,” “digital pitchforks,” and claiming you (rather than actual survivors and victims of abuse) are the victim. Do you feel “angry, resentful, and completely powerless”? Imagine how someone abused by a person in power must feel — imagine the anger, resentfulness, and feeling of complete powerlessness that person must have experienced for years while being ignored, gaslit, and portrayed as “crazy” by people who have public, respected platforms to disseminate their fictional picture of you. Taking abuse seriously means that, even if you believe someone made false allegations, you refuse to raise the specter of false allegations to discredit an accuser. Since you take abuse seriously, you understand how that specter has been raised time and time again to shut down actual abuse survivors and victims. Since you take abuse seriously, you have also studied the statistics and understand that false allegations are “few and far between.” That means the most logical response to abuse allegations is to trust them. Thus when people make allegations against someone you hold dear — and even though you believe those allegations are false — you would never, ever, blame people for trusting that person. Because trusting that person is the logical and right thing to do. As someone who takes abuse seriously, you want to encourage people to take allegations seriously — because we live in a society where survivors and victims are extraordinarily marginalized. So you would never, ever, raise that specter, even if you felt it was justified. Taking abuse seriously means you understand that what’s most terrible is the actual abuse, not people demanding that leaders please go the extra mile to make sure a marginalized voice is heard. You also understand why using misogynistic language is particularly painful when having a conversation with abuse survivors. Taking abuse seriously means that you don’t get to play a “I know how best to advocate for abuse survivors” card when you’re being called out by actual survivors and victims of abuse. It’s not your place to say what “part of advocating for abuse victims is” if you’re not yourself a survivor or victim of the particular violence in question. It doesn’t matter whether you’ve done what you’ve done “consistently.” What matters is whether it makes abuse survivors and victims safe. If they are not feeling safe, you need to listen. Taking abuse seriously means you actually do so, not just claim you do when it’s necessary to prevent damage to your reputation. It might be worth noting that someone being “a mentally unstable person” or “crazy” does not make them any less reliable or trustworthy than anyone else. Mentally ill people are abused and assaulted at a much higher rate than the general population, and the notion that we are untrustworthy or otherwise can’t be believed adds significantly to the vulnerability caused by our health conditions because abusers know that we will automatically be discredited and disbelieved. Invoking mental illness to discredit reports of abuse is itself ableist abuse that harms all mentally ill people by reinforcing the stigma-based myth that we can’t be believed, and is a huge red flag of its own. Those are really good points, Shoobie11. Thanks for adding them. I’ve seen mental illness used to discredit homeschool alumni stories so many times it just makes me sick now. You may be surprised by how much I agree with this post! I think many of these principles are true and good to put into practice. By way of clarification, I don’t want to overstate my knowledge of this situation or involvement in it. I have spoken with neither Tony nor Julie about the details of their divorce, only reviewed relevant documents and emails, not all of which are public. I am not a close associate of Tony’s, but work with many different event-planners in a given year. I am not, as some have said, dependent upon Tony for all of my income. I realize the conversation emerging around this situation in online forums has been incredibly triggering for some people, whose stories I take very seriously. However, I am not equipped or trained to host and moderate a forum for determining the truth of these claims on my blog or on Facebook. In my advocacy for victims of abuse, I have consistently and adamantly encouraged working through the legal system and appropriate mediators to pursue justice, and I have consistently and adamantly discouraged both trial-by-church and trial-by-twitter. There are third parties equipped and trained to hear testimony and get to the truth. I have consistently encouraged utilizing them, but my Facebook page is not one of them. It’s important to me to do what I believe is right and ethical with the information I have and in the forums I moderate. In this endeavor, I humbly ask for your patience and grace. I believe that you genuinely care about victims of abuse. However, your handling of this situation, I believe, shows both a narrow view of why people are wary of Tony Jones, as well as a lack of practical knowledge of how to support victims. This is not just about the specifics of what happened between Tony and Julie. This is about the fact that other survivors are watching, and the way you respond to this one case will determine whether or not they can trust you with their story. For many, the way you responded will mirror what they’ve experienced time and time again at the hands of people who have turned their backs on them. Also, it feels like you are emphasizing use of legal systems and third parties as a primary way to support victims. I find this quite surprising, as any victims advocate will tell you that the legal system can often be brutal and re-victimizing. For many victims, going through the legal system actually makes things worse, not better, for them, and thus counseling victims to go through the legal system is something that should only be done on a case-by-case basis, with the emotional needs of the survivor always front and center. Again, if you want to discuss this further, you can contact me through e-mail or Facebook. I am a survivor of sexual assault (childhood, adolescent and adult). For what it’s worth, the way Rachel has handled this has been far more life-giving to me as a survivor than the way many other people and blogs have handled it. Due to the ever-escalating vitriol I’ve witnessed on blog communities I once looked to for support, connection and being believed, I’ve had to completely withdraw from those communities because it’s been too triggering. I’ve seen commenters excoriated for daring to suggest, even in reasonable, appropriate terms, that it may not be prudent or helpful or even healthy to these parties to be speaking of things this way. I’ve seen silencing and shaming of these dissenters, the same silencing and shaming that many emergents in this have been/are being accused of doing. In other words, the hostility of this discussion in these communities makes seeking recovery there, as a survivor, completely unsafe and unwise. So, while Rachel may not have said all of the things you, as a professional, wished she would have said, or may have said things you wished she wouldn’t have, her decision to say relatively few things out of an abundance of caution has been very beneficial to me. And given Rachel’s track record of consistently supporting survivors, and I include myself on that list, well, I see her initial choice of words — at worst — as a misstep, not as an indication that she has a narrow view of these issues. No survivor advocate — professional or otherwise — will *always* do or say the right thing in every circumstance. No one. And no survivor will either, for that matter. Abuse is not of God. But if grace, or the possibility for redemption, is only applied to those who’ve been abused and nobody else, then it is a false grace and a false redemption and it is not of God, either. Hey Rachel — I genuinely appreciate that you took the time to read and respond here. Honestly, I would not be surprised to hear you agree with most of this post. I first started reading you after you interviewed Boz from GRACE on your blog. I really, really appreciated you giving Boz that platform and I learned a lot from that interview. I’ve been following the amazing work Boz is doing ever since. So what I’m actually surprised about is not that you would agree with many of my sentiments, but that — being in agreement with them — you responded the way you did. I won’t go into detail on that because I know you have been experiencing an avalanche of internet comments as of late and I don’t want to make you even more overwhelmed. So I’ll simply say that Shaney perfectly expresses my feelings here. Also, Shaney is awesome. So if I can hope for one thing, I’d hope that you take her up on the offer to talk and figure out how you could have better responded — and respond in the future — to alleged situations of domestic violence and such. I am rooting for you and this conference — I think you have assembled a group of often-marginalized voices that should be centered and heard today. I’d simply hate to see that done at the expense of another group of marginalized people. And if you can’t afford a lawyer but the other party does and can pay $450 an hour? For a person who says they are an advocate for abuse victims….to put it bluntly, you’re terrible. I am not going to mince words because you have let a lot of people down with your incompetence. You have caused secondary trauma. What you said publicly was terrible. Blocking me when I reached out to you….was terrible. Calling my reaching out to you “harassment” was terrible. Having your husband give me a domestic abuse hotline number and saying the courts are the best place for justice….was terrible. You handled and are handling this…terribly. Thanks, Brad! And I loved your response at TWW. Taking a break from Twitter and Facebook til Friday, so I’m just gonna post this here. Rachel, Nadia, I hope ya’ll read this. Let’s say this is just a rumor. Let’s say that Julie is lying. Where does that leave us? Suddenly we were right to work with an alleged abuser and to not contact the one claiming abuse in any way? Suddenly we were right to accept “relevant documents” that schew in one parties favor, the party we’re profiting from, without even reaching out to receive documents from the accuser party, to hear their side of the story? See this isn’t just about Julie. This is about others too. Abuse survivors who have been silenced at every turn, can’t afford the legal channels or mediators, don’t have anyone that trusts them cause their abuser has used their power base to turn all against them, and have only an internet forum to turn to. Fellow abuse survivors like them that believe them. this is about my friend who is an abuse survivor, who now knows that if any close friend of Nadia’s abused her that Nadia would give more credence to his story than hers. Would hang up on her when she called and say she was gossiping. This is about safe spaces, or lack of them. This is about abuse survivors reading about how someone who is rumored to be an abuser being given credence, and his “relevant documents” being given credence, and all that just so a conference can go forward, and be profited from, in which his name and brand can profit too, instead of just simply moving away and asking his company to not sponsor anymore. This is about them now seeing that they won’t recieve any belief if the spaces they are seeking safety from will profit from continuing to work with the person they are saying abused them. All those abuse survivors will not see safety in you anymore Rachel. In you anymore Nadia. Because even it is lies, or rumors, even if it’s a he said/she said story where the whole truth is not out yet, even if there needs to be third party mediation, and legal channels pursued etc. ya’ll still chose to move forward with an alleged, rumored abuser in a conference with his organization’s name on it because it would hurt your brand not to. Well, I don’t think it would hurt your brand at all, and all those abuse survivors would certainly see some wonderful solidarity with them that would in turn increase your profits. What is the best way to handle rumors and allegations of abuse? Don’t associate with the person being alleged to be abused til ALL the relevant documents are perused and decided on by a third party mediator/legal channel. Til the case is presented in court and a decision is made. Til BOTH stories have been heard and what is truth is found out. Then it’s safe to make a decision based on your conscience on whether to associate with that accused person. To do so before only tells abuse survivors that you’re willing to give more credence to their abuser while they’re still in the process of proving him an abuser. Til then ALWAYS stand with the one saying they’ve been abused. 100%. Completely. Forget relevant documents and whether their story lines up. Guess what, many times for abuse victims their story doesn’t add up. Til the whole truth is out. Many times they’ll have tons of relevant documents proving them wrong, til the whole truth comes out. Ya’ll should know this. Ya’ll have seen this time and again. The prudent, wise thing to do is to wait til the Whole Truth comes out, then choose whether or not to associate with accused. The prudent, wise, and SAFE thing to do for future abuse victims coming forward to you is to show them they will have a safe space, and that your brand, organization, whatever doesn’t even associate with ALLEGED abusers. I hope ya’ll will make the right decision here. I highly respect you both, and consider you levelheaded, wise leaders. This situation is about more than a private divorce. It is also about a public event showcasing the role of women in the church, lead by two of the most prominent speakers in the church today. This public event is being organize by an accused wife abuser that has allowed unresolved accusations to linger for years. There are many things we don’t know. But there are a few facts that are clear. Public knowledge of the accusations of abuse go back to 2009. The most recent spate of publicity of the accusations date to September 2014. In the process leading up to organizing the Why Christian conference, what due diligence was done by Nadia & Rachel and their staff to address these unresolved and very serious accusations? 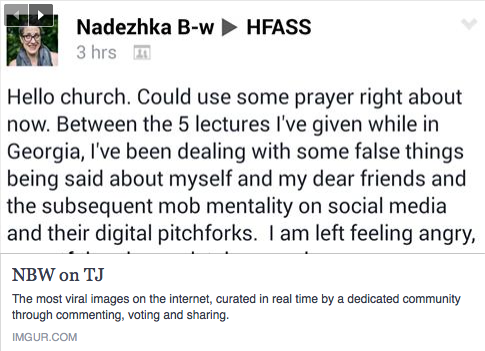 Did the JoPa group disclose these unresolved issues to Nadia & Rachel? If you can’t trust JoPa to disclose information that they are aware of, that may be harmful to your own reputation and your business, how can you now trust them to follow through with the conference that is planned? It seems to me failure to disclose known facts that will harm your business would be grounds to terminate your contract with JoPa and move forward with a conference organized by someone else. There are many things we don’t know about this situation. But at this point, we can ask reasonable questions and take reasonable actions about the facts that are undisputed. You really spoke my heart on this, R.L. Thank you. Abuse lends itself to helping develop mental illness. Ever been in a situation completely out of your control, and as a result want to control the world? Most abuse survivors would say yes. Makes you a prime candidate for anxiety. Don’t know how to cope with the world anymore? Can’t handle the guilt, shame, pain, etc. anymore? Welcome to club depression. Traumatized by what happened to you? PTSD. Oh, and we’ll just freeze your emotional development as happens in abuse so you don’t develop coping skills as well as unabused persons. That should send your stress levels through the roof. And some idiots still don’t realise the connection IS a causation factor – from the abuse. Mental illness can be a flashing red light that tells us something went wrong in a person’s life. I can frequently pick out women who have been abused, because I recognise the signs, even if they aren’t aware of it at the time. PS. Thank you Ryan for believing us, listening, and letting us tell our stories without judgement.